Editor’s Note: I’ve decided to begin posting some reviews of films screening at Hot Docs 2009 early, hopefully helping anyone attending make some decisions about what to see. Paris 1919 is screening on Friday May 1 at 7:00pm and Sunday May 10 at 11:00am at the Isabel Bader Theatre. Paris 1919 (Director: Paul Cowan): Having read the book by Margaret MacMillan on which this documentary is based, I was a little dubious upon hearing that director Cowan would be using re-enactments to create the atmosphere of the Versailles Peace Conference. But wisely, he chose to use these strictly as atmosphere, letting the archival footage and especially the strong narration by Canadian actor R.H. Thomson carry the weight of the story. In the early months of 1919, the world, weary of fighting, gathered in Paris to hammer out a peace accord. But the Great War ended in an armistice, not a surrender, and so there was much at stake for all the parties. The old empires had collapsed and into the vacuum stepped a man promising self-determination for all the peoples of the world. US president Woodrow Wilson offered his own version of Obama-like hope, especially to the smaller nations of the world who had heretofore been the pawns of imperial powers. The defeated Germans also hoped that Wilson’s steady hand would deliver peace with justice. Alas, it was not to be. Instead, Britain and France were determined to bleed Germany dry for war reparations. Both countries had suffered enormously, especially France, and they had little regard for the sufferings of Germany. Voters in both countries were putting enormous pressure on their leaders, David Lloyd George of Britain and Georges Clemenceau of France, to bankrupt Germany as punishment for her guilt in starting the war. In contrast, Wilson was obsessed with the idea of establishing a League of Nations, a body that would arbitrate disputes between nations in the hope of preventing war. His idealism and naivete were soon challenged, and gradually he made many compromises in order to secure support from the other leaders for the League. The end result was disastrous for Germany and ultimately for Europe and the world. Maps were redrawn displacing millions of people, assets were seized and monetary damages demanded. The German delegation went home angry and humiliated. In the years that followed, the German people’s resentment was ripe for exploitation and rising nationalism soon engulfed the whole country, leading to Nazism and another world war. 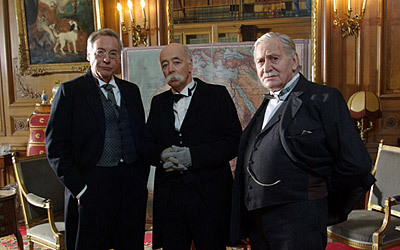 Cowan’s film couldn’t have encompassed all the various negotiations that went on at Versailles, and huge chunks of MacMillan’s book are simply passed over, including the fate of countries like Poland and Turkey. But he captures the essence of the power struggle between the leaders, and makes some great choices in the re-enactments. By focusing on minor characters like Harold Nicolson and especially economist John Maynard Keynes, we get a real feel for what it was like for the bureaucrats labouring in smoky rooms to untie the Gordian knot of European grievances, especially when they felt their leaders were pursuing the wrong course. I think the best compliment I can pay to Cowan’s film is to say that it left me wanting more, and for that, I will return to Margaret MacMillan’s excellent book, Paris 1919: Six Months That Changed the World. This entry was posted in Books, Documentaries, Film Festivals, Hot Docs and tagged #hotdocs09, history, war, worldwar1. Bookmark the permalink.